My kids are going back to school this week! The summer went by so fast. And the fact that it is still blazing hot, makes it even harder to believe that it’s school time! Smokey Eyes with ease! The NEW Essence Smokey Eyes Set ($3.49 USD each) combines 3 velvety shades with satin and shimmering finishes to create the perfect smokey eye in a few simple steps. Includes dual-ended sponge applicator. Available in Smokey Night 1, a classic smokey eye pallete in grays and Smokey Day 2, taupes and browns. One eyeliner – two styles! Whether you’re trying to achieve a fine line for an elegant, classic look or a bold line for a dramatic look – with the NEW Essence 2-in-1 Eyeliner Pen ($3.49 USD), you have both options at your fingertips. Learn more at http://www.essence-cosmetics.com and purchase at Ulta and other great retailers! What I think: I usually don’t have luck with at home waxing kits, but I was pleasantly surprised with this one! I waxed my forearms. It took a little getting used too, but after a few minutes, my arms were soft and smooth! The first arm I did was a little red afterwards (user error, wax too hot), but I applied moisturizing lotion and it was fine after about an hour. The second arm was not red, so I know now to wait a little bit after heating up. I think this is a great product at a good price! Purchase at http://www.ulta.com and Ulta stores near you. Trout Pout Bloody Brilliant Lip Crayon ($20 USD) — Opaque, light coral crème. Long-lasting, all-in-one formula delivers lacquer-like shine and high-fashion colour. Intense shine of a gloss and the highly pigmented colour with the full coverage of a lipstick. Slimline pencil with built-in sharpener is perfect for on-the-go lip lining. Helps to improve lip moisturization with Mango Seed Oil and Marula Oil. What I think: This lip crayon is so moisturizing! It is creamy and highly pigmented, but also shiny like a gloss. 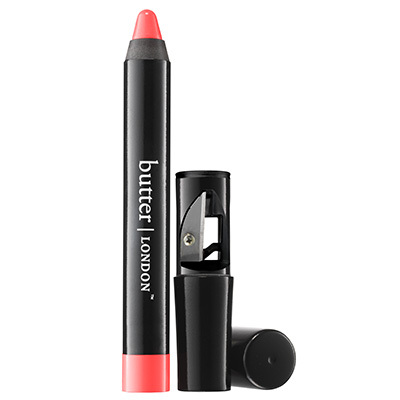 Trout Pout is a summery coral perfect for the season! Bairly Sheer Ultra Mist Foundation in Shade 3 Golden Beige ($12.99 USD) — Get the buildable, blendable, breathable coverage you want with Bairly Sheer Spray-On Airbrush Foundation. Bairly Sheer blends & looks flawless unlike ordinary makeup providing the ultimate buildable coverage without being heavy. The secret is a soft-spray that’s easy to apply, made for everyday use, and lasts up to 18 hours. What I think: This is a first for me, I haven’t tried aerosol foundation before. I shook it as directed and sprayed, but only air came out at first. Then a clear liquid, then the foundation. I found that the best way to get a smooth look is to pulse the spray in one area, then blend it with a brush or sponge. It gives a light coverage and evens out my skin tone. It also feels really natural on, not greasy or heavy. Great price, too! 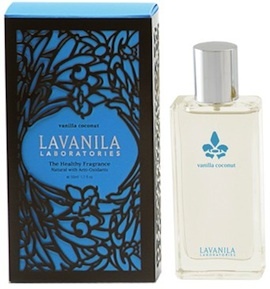 Lavanila Laboratories The Healthy Fragrance in Vanilla Coconut ($58 USD) — will instant transport to you to paradise! A carefree and tropical escape awaits with this exotic blend of young creamy coconut, sweet Tahitian tiare flower and warm Madagascar vanilla. Lavanila’s collection of all-natural fragrances is luxurious and addictive. Each fragrance starts with a warm base of Madagascar vanilla and layers on a unique blend of pure essential oils for an exquisite expression of nature that capture a mood, a memory or a moment in time. What I think: This smells amazing! It makes me think that I am on a tropical vacation, even though I’m working. The fragrance does smell natural, I love that the ingredients are so high quality. What products are you loving this week? Leave a comment and let me know. Previous postNew Yes To Products Will Get Your Skin Glowing!